What does it take to make it? 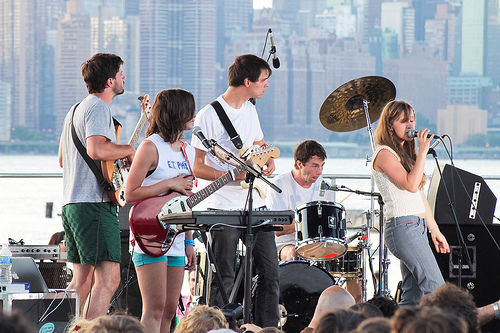 A New York Magazine article by Hugo Lindgren, Brooklyn’s Calling, takes a look at the history of one Brooklyn band, The Dirty Projectors, and their rise to the top. Like all proper rags-to-riches stories, the band’s founder/mastermind of musical direction, David Longstreth, assembled the experimental rock group while living in a broken-down brownstone in Bed-Stuy with eight roommates. “The Dirty Projectors are the band you’d get if some Ivy League music majors decided to convert their acappella group into a rock band,” describes Acidjack on NYCTaper.com. The band was officially named (after Longstreth’s odd job as a projection equipment cleaner) with the release of The Glad Fact on the Western Vinyl label in 2003. Current band members include: Amber Coffman (singing, guitar), Angel Deradoorian (singing, keyboard, samples, guitar, bass), Brian Mcomber (drums)—and most recently added Nat Baldwin (bass), and Haley Dekle (singing). A passionate group of fans who were hungry for something different and were enraptured by Longstreth’s fervid imagination. Admirers went so far as to compare him to Prince and David Byrne, classic outliers with the singular power to draw the mainstream toward them. Passion for music or desire for fame? Under Domino Records, the band released a new album, Bitte Orca, with their first single Stillness is the Move in June 2009. Photo courtesy of rogerimp on Flickr.com. This entry was posted in Show and tagged Band, Brooklyn, Famous, New York Magazine, The Dirty Projectors. Bookmark the permalink.